There’s a lot of talk these days about a “mantra revolution,” and enough action in the chant world to back up the premise. 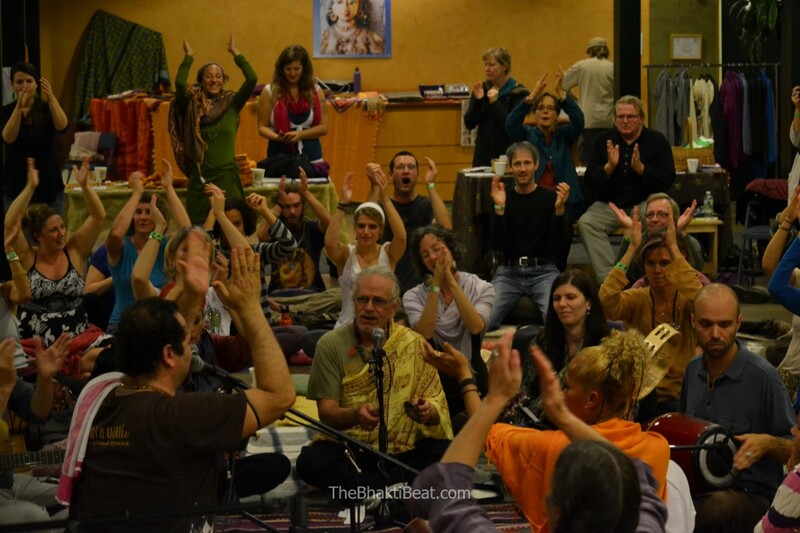 Witness: chant festivals that attract thousands, “rock-star” wallahs, new music expanding in every direction, community kirtan rising…even mainstream media coverage of mantra music (gasp!). Yet it’s an undeniable truth that the bulk of the action is coastal: California and the northeastern seaboard are leading the charge, with some kirtan hotspots scattered in the midwest and mountain states. When mantra mania hits Vermont, a state known more for maple trees and mountains than mantra music, you’ve got to believe there’s something to this movement. 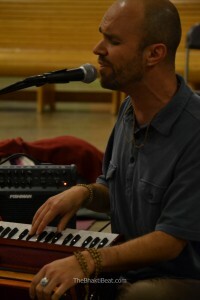 Enter VerMantra, which for the second year now — thanks to the nonprofit Call and Response Foundation — has brought 12 hours of nonstop multi-flavored kirtan to a state that is just barely on the kirtan map. No, there were not thousands of people in attendance, and no rock stars or divas on the bill. Instead, there was a solid line-up of 10 great bhakti bands, each one having signed on for peanuts, driven the extra mile to be there, and bringing with them an attitude of genuine service and devotion to the spirit of the gathering. You had luminaries like Gaura Vani and SRI Kirtan. You had up-and-comers like Devadas and Kirtan Soul Revival. You had mantra warriors Keli Lalita and Adam Bauer and regional favorites Dave Russell and Tom Lena. And you had a taste of the local talent in Yogi Patrick & the Funky Shanti, and the incomparable kirtan jam collective, the Kailash Jungle Band. The “stage” was the center of the room, and everyone circled ’round the musicians like bees to nectar. Collaboration and community were key: everyone — musicians and ticket-holders alike — was in everyone’s band. It was, by design, the kind of environment where the boundaries between performer and audience evaporate. Where callers and responders meld together in a circular flow of rhythm and song, united as one voice calling out in joyful abandon. The kind of environment where magic happens. 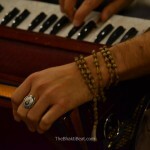 Brooklyn-based wallah Devadas used the analogy of a “Mulligan stew” to describe the gathering — the idea that each band, each musician, brings something unique to add to the bhakti soup. “We come from all these places — different paths, different teachers — and we each bring our own ingredients, our own styles and perspectives. In the end we have something like Mulligan stew that feeds us,” he said. Devadas, a devotee of Mata Amritanandamayi (Amma) who has sung at her darshans in the Northeast U.S., warmed up the stew-pot early in the day with the recitation of the 1,000 Names of the Divine Mother. He stuck around to stir the pot throughout the day, playing mridanga or hand cymbals or just singing. 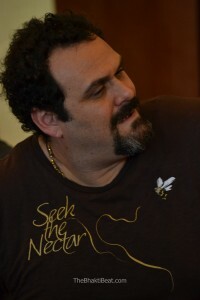 Twelve hours later, he was back at stage center to serve up the feast and close out the fest. “To play clean-up,” the other musicians teased him. With an unassuming grace, Devadas effortlessly elevated the delicious mood of devotion that had been simmering for nine sets to a whole new level. Backed by a core band of Gaura Vani (mridanga & vocals), SRI Kirtan’s Ishwari and Sruti Ram (vocals), KC Solaris (tabla), Adam Bauer (bass), Richard Davis (guitar), Rasamrta Devi Dasi (cymbals) and Louise Ross (flute), he steered us right into a slow-building bhajan learned from his guru Amma that gradually but inevitably peaked in a tidal wave of ecstatic crescendo. The room was an ocean of motion. People were dancing, clapping, spinning, singing out the Names like “souls crying out for our divine home,” in Gaura Vani’s words. The mantra seemed to take on a life of its own, letting us surf the crest of the wave just…long…enough before settling us down ever so gently on the shores of our souls, as Kahlil Gibran might say. Radhe Govinda Bhajo, the first chant Devadas led, is a traditional melody that Amma “has been singing for a very long time,” he said. She taught it to him and he spoon- fed it to us. It was delicious. At the risk of sounding hyperbolic, this was for me one of those peak experiences in kirtan that just doesn’t happen every day. Maybe it was the fact that we’d been there for nearly 12 hours, simmering in the stew, steeping in all the flavors of bhav. Maybe the group was really “on” after singing together all day, as the boundaries dissolved and egos melted away and the energy rose. I don’t pretend to understand the magic that happens in kirtan. I’d reallllly like to, but I think it’s beyond intellectual comprehension. It defies logical explanation. The power of mantra, as Dave Stringer has said, is not something you have to “believe in” or even understand; it is something that must be experienced. Simple as that. All you have to do is sing the Names. Special thanks to director Jennifer Canfield and co-founders Susan Murphy and Ed Ritz of the Call and Response Foundation, whose programs support community kirtan events and bring mantra music to populations in need. Please visit their website, www.callandresponsefoundation.org, and consider donating to support their efforts. 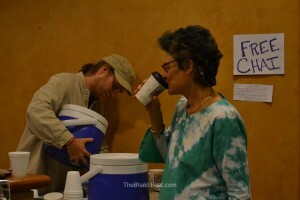 Brenda…you provide such loving seva for our bhakti community. I bow to your wordsmith expertise, your ability to capture the essence of the experience and the priceless photos that help us all remember the beauty and love we created together. All love and gratitude. Dear Jen: it’s an honor to work with people such as yourself who embody the bhakti spirit of service, compassion, inclusiveness, and gratitude. YOU are an inspiration to all of us in this community. 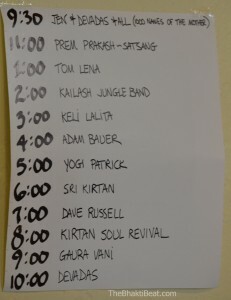 And VerMantra was, like Gaura Vani said, “grassroots community kirtan at its best.” Thank you for making it happen. Right back at you Vermont gal!